You might have noticed that the clock speeds of chips haven’t really increased in years. Instead, our computers now come equipped with multi-core processors, farming out tasks to be completed on separate chips rather than crunching more in one place. The reason for that is, oddly, the fact that the transmission of data between memory and chip can’t keep up with higher clock speeds. The speed with which electrons can be sent down the interconnects between memory and processor are slower than the speeds at which faster silicon can chomp through the information — a problem known as the Von Neumann bottle-neck. There is an alternative, though, which involves swapping out electrons for photons of light. If the electrical interconnects could be replaced with something optical, information could be sent between memory and processor at the speed of light. Then, there would be no trouble in transmission keeping up with the speed of computation. It’s not a new idea, nor for that matter a particularly useful one in isolation: simply replacing the interconnect with something light-based still leaves the task of switching between electrons and photons at either end, in order to interact with the processor and memory. In fact, doing so is so inefficient that it destroys the gains made by going optical in between. Instead what’s required is a computer architecture that can run on photons alone, with the memory and processor operating with light rather than electricity. And that’s what researchers have been trying to do. Now an international team of researchers has finally cracked at least part of the problem: they’ve created the world’s first light-based memory chip that can store data indefinitely. Scientists have tried to create this kind of photonic memory before, but it’s always required power to store data. When the power was turned off, the data was lost. That works fine some of the time, but fast internal storage, like your SSD, needs to be able to keep hold of information even without power. The new kind of memory, developed by researchers from the Universities of Oxford and Exeter in the UK and the University of Munster and KIT in Germany, uses what’s known as a phase-change material as the basis of its storage. It uses an alloy of germanium-antimony-tellurium known as GST —the same material that’s used in rewritable CDs and DVDs. In a paper published today in Nature Photonics, he and the rest of the team explain how they’ve managed to build a device, pictured below, in which a small piece of GST (which appears yellow), one-micron square, sits on top of a silicon nitride ridge, known as a waveguide (which appears pink). Think of the waveguide as a kind of miniature fiber optic cable that can carry light: pulses of a laser can be sent down the guide, where they can interact with the GST and then continue out to the other end. A scanning electron microscope image of the device. The GST phase-change material, highlighted in yellow, sits on top of the silicon nitride waveguide, highlighted in red. When the team fires high intensity pulses of light down the waveguide, they can change the state of the GST. A very intense pulse can be used to momentarily melt and quickly cool the GST, causing it to assume an amorphous (glass-like) structure. By sending a slightly lower intensity pulse down the waveguide, the team can raise the temperature above the crystallization point but below the melting point, which puts it into a crystalline state. But here comes the clever bit: when a light with a much lower intensity is sent through the waveguide, a little of light seeps out into the GST. Depending on what state the GST happens to assume, a little more or a little less light is transmitted from one end of the waveguide to the other. The team can measure the differences with incredible accuracy, which allows them to tell if the GST is crystalline or amorphous. By writing with strong pulses and reading with weak pulses, the researchers can easily replicate the 1s or 0s you’d find in normal memory. A schematic of the new memory device, showing its structure and the propagation of light through it. That might not sound impressive until you think about the fact that light of hundreds of different wavelengths could be sent in a single pulse. In theory, that means the team could read and write to thousands of bits at the same time, essentially providing virtually infinite bandwidth. The device has another trick up its sleeve, too. The team has found that different intensities of strong pulses can actually be used to create different mixtures of amorphous and crystalline structure within the GST — making it 10 percent amorphous and 90 percent crystalline say, or 50-50. When the lower intensity pulses are then sent down the waveguide to read the contents of the device, those subtle differences in composition can be seen in the transmitted light, too, allowing the researchers to reliably write and read off eight different levels of state composition — from entirely crystalline to completely amorphous. That multi-state capability could open up a whole different world of computing. Instead of the usual 0 or 1, the researchers are in theory able to represent a 0, 1, 2, 3, 4, 5, 6 or 7, quadrupling the amount of data that can be stored in a single bit. And the researchers have ideas that could make even better use of the extra capacity — by performing computational operations in memory instead of at the processor. “Everyone is closeted into thinking that all processing has to be a von Neuman process,” explains Bhaskaran, referring to the way calculations are typically performed by the processor, while data is passed back and forth to the memory. But by using memory that can represent more than two states, some of those states can be used to juggle calculations themselves, rather than simply storing data. It’s a field of research in its relatively early stages, but this kind of memory could eventually end up doing some of the processor’s work for it. There is, of course, some work still to be done. First of all the device needs to shrink a little: a single bit occupying a square micron may sound small, but it’s gigantic by silicon chips standards. Still, the team says they’ve already been able to decrease it’s size, and isn’t too worried about shrinking it down a lot further. More troublesome, perhaps, is the rest of the architecture required to make purely optical computing a reality. 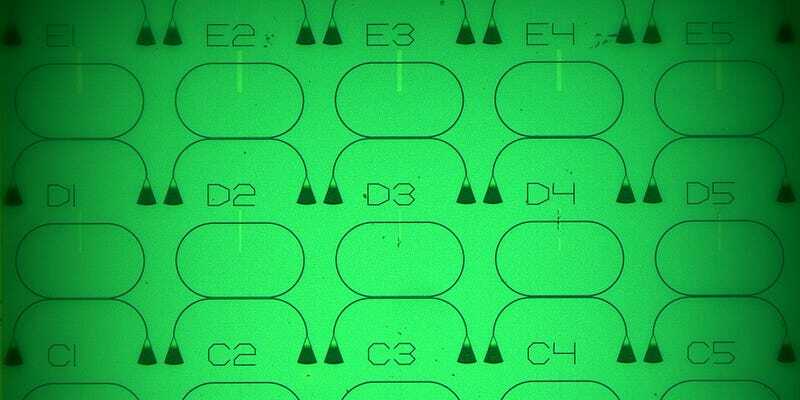 “Critics might say ‘This is nonsense, there’s no point having optical memory without an optical interconnect’,” muses Bhaskaran. “But to that, we say, you have to solve one problem at a time.” He’s right on both counts. Which probably explains why the next thing on the research group’s list are the opto-electrical interconnects that are required to link the memory to a processor. Hopefully they can make light work of it.